Maarten Ten Holter of Vripack sends me a note saying that he'll be displaying Beothuk, the 31.11m Doggersbank, and Moonen's 27.43m Commercial Break at this month's Fort Lauderdale Boat Show. Beothuk, launched by the Kuipers yard in 2008, is the first yacht in the world with all-LED lighting aboard. 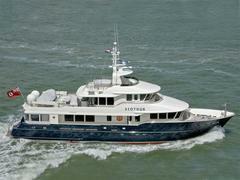 Designed by Vripack, she sleeps six guests in a master, double and twin and has a long range of 4,000 nautical miles. Maarten's particularly enthusiastic about her engine room, describing it as "Like a jewellery store." She's on the market at $15.9 million. Commercial Break is a go-anywhere expedition yacht with several transatlantic crossings under her belt. Lloyds classed and MCA compliant, she accommodates up to seven guests in a master, double and twin plus a Pullman berth and is asking $5.9 million.